Senjyu, which means “Eternity of Life”. 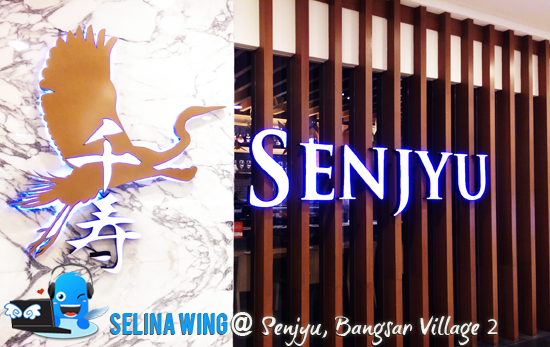 This word "Senjyu" sounds good and suitable to match with the "flying crane" in our logo symbolises longevity and soaring to greater heights. I felt like eating the premium japanese dishes, make my life become imagination of eternity! 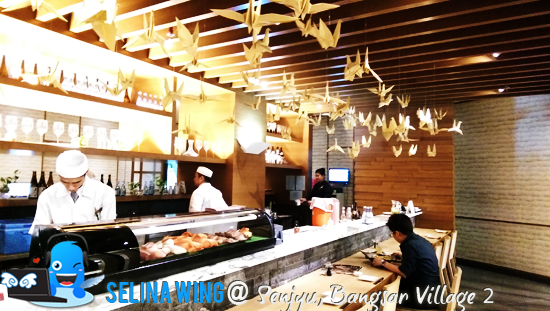 That is why Senjyu give an inspiration for the truest traditions of Japanese cuisine. They make the customers infused with the imagination of contemporary tastes. 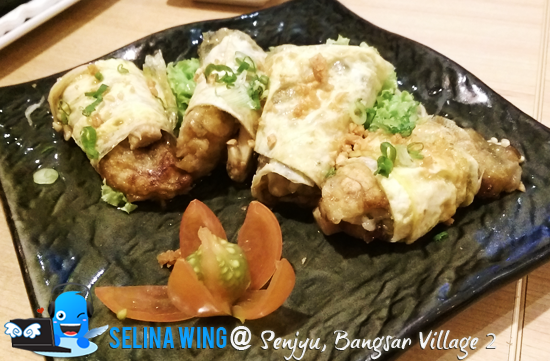 At the heart of Senjyu lies a simple philosophy of offering only the freshest,tastiest and best. They suggested that we try to eat the Premium set lunch on next time we visit the Senjyu Japanese restaurant! 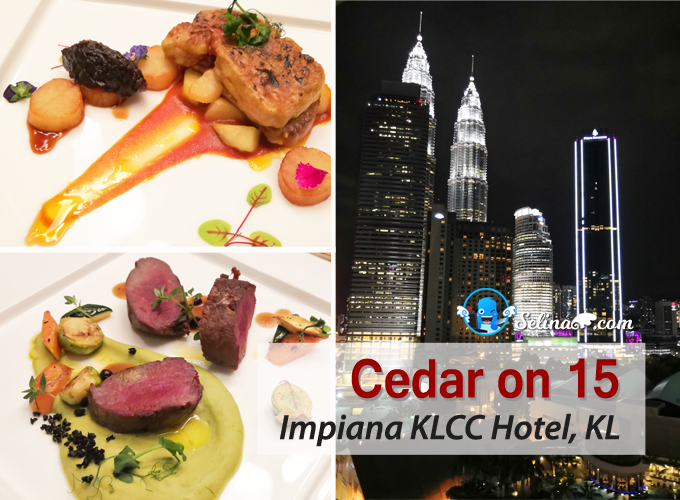 My mom and I like to thank to Ms. Prema, Living Social Malaysia and Marketing staffs, Apex-pal Malaysia as they treated us so very great. We enjoyed to talk with them while we are sharing our experience to eat the Japanese dishes! 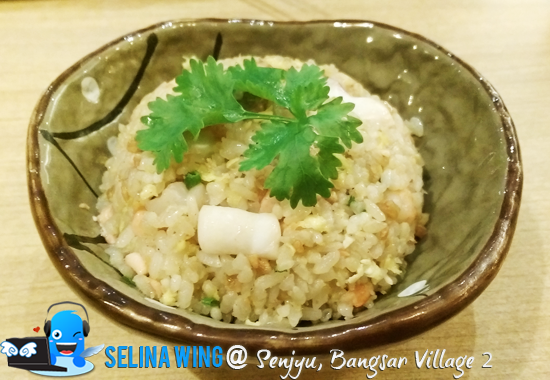 If you interested to eat Senjyu, please check on Living Social Malaysia to grab the vouchers! Hana Moriawase is first-served for us to eat the raw. I am really like the raw tuna and salmon so mostly. They were cut into just the beautiful thickness, it easy to bite! I don't like to eat the raw of octopus, but when I ate it so this taste are fresh and cool. Hana Moriawase - exquisite an assortment of fresh raw tuna, salmon, surf clam, octopus and butterfish. It is a must-try if I bring my friend come to Senjyu again! First time, I see new menu; Oyster Sashmi is so big, juicy, succulent-taste lemon! I feel it is good value to get the succulent briny air-flown live oysters served with tangy citrys sauce. That is why the oysters are one of the main fresh ingredient. I surprised that Yasai Maki is vegetable sushi! 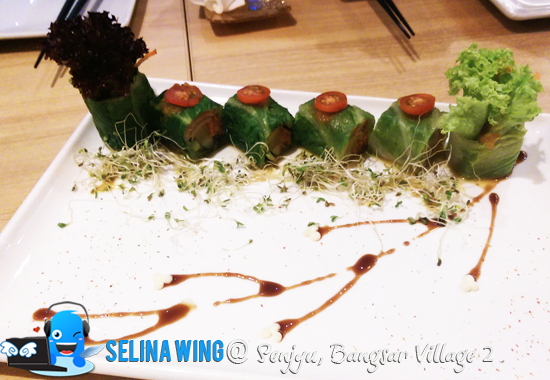 It also have sweet beancurd wrapped in lettuce. It don't need rice inside the sushi, more texture of vegetables inside, make me felt eat a good healthy sushi! You just eat one sushi in your mouth to bite so slowly, ya! Butterfly Maki intricate ensemble of premium river eel slices wrapped around tempura crabstick sushi roll with sweet teriyaki sauce.This is first time I eat a very beautiful culinary sushi! I love to eat the trickness of eel, so it make me want more! I recommend you to try it! It is reasonable price to grab new 'premium' sushi like this! 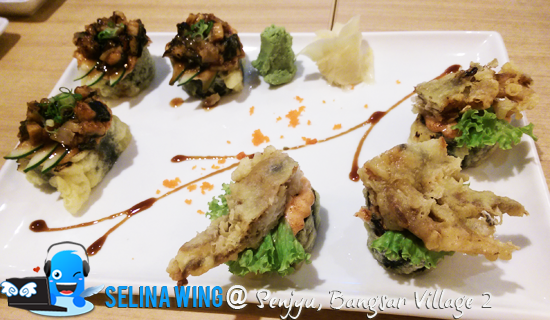 It is very good culinary to make us attract the Soft Shell Kani & Unagi Mental Maki sushi! 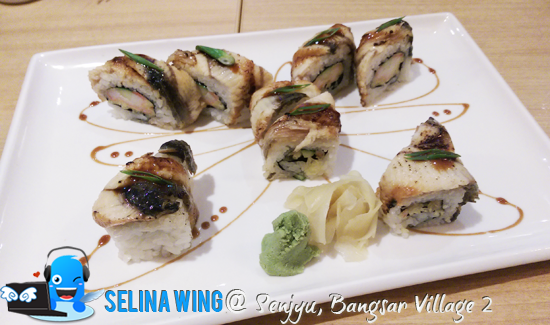 I also love soft shell kani with vegetable, but I prefer to eat the Unagi Mental Maki because it is easy to bite! For me, it is best sushi that you better to try it! I like the creative sushi to get the succulent oyster and various types of mushrooms wrapped in an egg omelette. 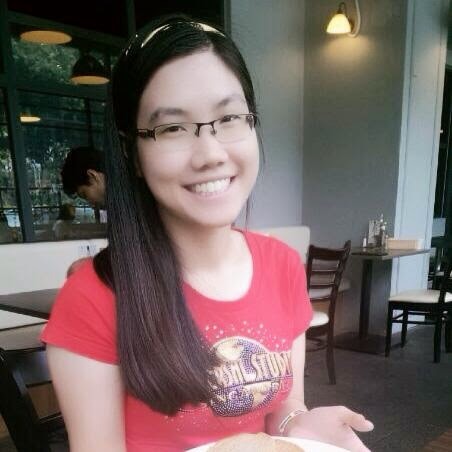 I love to eat the mushroom mixed with egg omelette! I can taste the soft oyster inside. I thought that this oysters looks alike fried chicken! Haha, I ate it, more like fresh oyster with mushrooms so it is suitable to be sushi! Hmm, I don't feel like to eat seafood fried rice because it looks as boring, but it's good suitable for the old people who don't like Japanese sushi, so they can order the fried rice to eat. It is not very oily. They tried to make a very healthy fried rice for a family who share to eat together. Shiratama Zenzai - Delectable Japanese rice cakes with black sesame filling, served in hot red bean soup. I am really love black sesame in mochi, long time I don't eat it. At end, I happy to eat the 'Shiratama Zenzai' soup dessert become my favorite! It have three soft balls with black sesame, I want to eat more balls than drink red-bean soup! 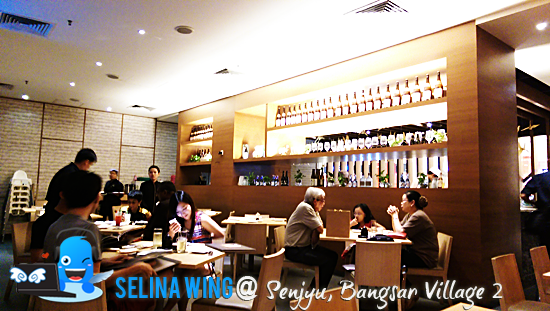 Senjyu love to provide the Malaysian Chinese people 's favorites, that is why they chose the red bean mixed with black sesame inside the mochi balls, make us felt a taste combined to feel a warm-sweet soup! 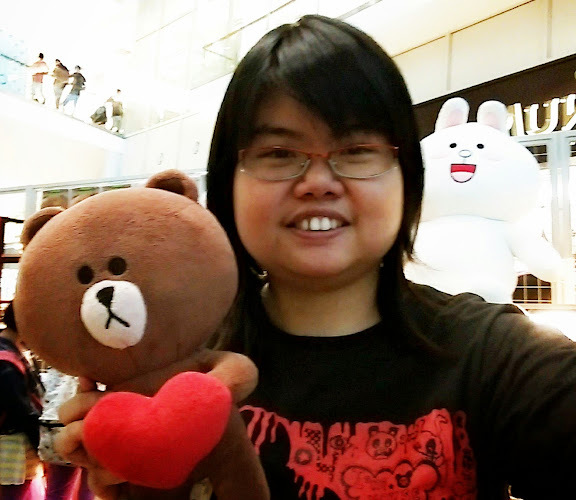 We had a great dining experience in Senjyu and wouldn’t mind revisiting the restaurant again when we have free time. The food was good and the price was reasonable given the fine ambience and the quality of the food. 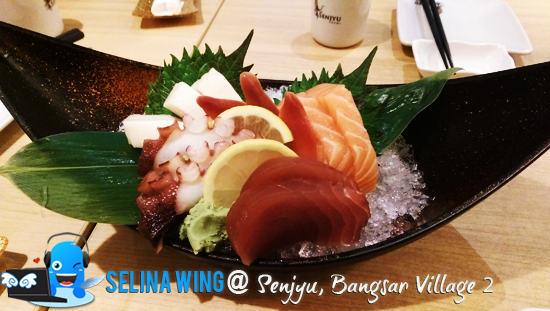 Do check it out if you like Japanese food! You better to buy the voucher from Living Social Malaysia!